Surat Al-Kahf Series- Part 2: When Money Talks…Shut It Up! [Surat Al-Kahf Series- Part 2]: When Money Talks…Shut It Up! You’ve probably met one of those people before; the kind who don’t necessarily brag out loud, but instead work it into the conversation to let everyone know how ‘well’ they’re doing. They feign that shocked look when they hear that not every person in the world owns a private jet or spends summers in Cannes with all the celebrities. Then they’ll pout as they try to make you feel better about your miserable life, all the while adding more insult to injury, with details about how they spend lonely nights on their 20-feet yachts and light their cancerous cigars with $100 bills, rubbing their riches in your face till your teeth hurt. Well, on second thought, I really hope you’ve never met anyone like that. I must say, it’s not a very pleasant experience. And even though these people might brag about modern-day luxuries, their three-step technique is as old as time itself, and is mentioned in the Holy Qur’an more than 1400 years ago in a chapter Muslims are encouraged to read every single Friday. It’s the story of the man with two gardens in Surat Al-Kahf (Verses 32-46), and yes, we read it weekly for a reason! So let’s quickly recap the events of the story. Two men have a conversation in which the richer one boasts about his wealth, denies Judgment Day and lets arrogance overcome him. The less fortunate man reminds him it can all perish in an instant, and soon enough, the wealthy man’s estate falls to pieces before his eyes. The End! Perhaps they were neighbors, but companionship was all those two men had in common. One’s resources were scarce to the point of negligible, while the other man had it all! Endless palm trees surrounded his vast acres of lush grapevines and huge field of crops. A river gushed between his two heaven-like gardens to eliminate the problem of irrigation. His estate didn’t manage itself obviously, which is how we know he probably had hundreds of employees working for him. This man’s empire produced crops and fruits at full capacity, with 0% probability of lost or damaged goods. The money rolled in endlessly, and well, this man was evidently one of those ‘if you got it flaunt it’ kind of guy! Yet the wealthy man did not go up to his poor companion and boast out of nowhere! No, Allah specifically explains that he let it slip in a conversation both men were already engaged in. And what was the poor man’s response? Nothing! I mean, what would you say when someone adamantly tries to make you feel less of a person because you’re not rich enough? Lesson 1: Planting a seed of inadequacy in other people’s hearts is the first step downhill. You can’t drag someone down unless you’re lower than they are, and that’s what showing off turns us into: conceited, mean and low human beings. For some reason, some arrogant people with high statuses hear stories of disasters around the world and brush it off completely as if they’re not susceptible to any of that. Their wealth blinds them into thinking they’re superior in this world, and consequently the first runner-ups for bigger treasures in the Hereafter. That’s arrogance on top of arrogance! At this point, they become unfair not only to people, but to themselves, for they forget everything they own was ‘given’ to them by Allah’s will. The poor man reminds his rich neighbor that his arrogant attitude is a form of ‘disbelief’ in the Lord, and explains that all his wealth can disappear in the blink of an eye. Lesson 2: Conceit leads to abusing others, but before that happens, it violates our own souls: the pure loving hearts we once possessed become tarnished with self-importance. A true believer understands that poverty is a test from Allah , but so is wealth! It’s your humble attitude that counts, not your bank account. This poor man did not ask Allah to terminate the wealthy man’s kingdom, but let’s face it, most people would feel violated and abused by the insinuations that they’re not ‘good enough’, and those negative feelings will definitely yield negative vibes. Take for a example a poor woman, who can barely pay school tuition, listening to her rich cousin go into excruciating detail about how tiring it was to throw such a lavish party for her daughter’s sixteenth birthday. She complains how the tulips flown all the way from Holland were not the right color, and the giveaways were not engraved with each guest’s name, like oh my God, how embarrassing! Let’s pause here for a second, how do you think that poor woman listening to this would feel? She would probably start harboring anger and hatred towards all rich people, wouldn’t she? The wealthy man’s empire tumbled to the ground, and in my humble opinion, that is also a symbol of destruction in general, whether in material things or in society as a whole. This poor woman will probably feel pressured to throw her own daughter a party too, with money she doesn’t have! Lesson 3: Violating people’s meager lives by ridiculing them poisons their thoughts with the need to compete, to live up to shallow expectations, and that only creates hatred and jealousy. What about us? How do we remain humble in a society that shoves competition and immodesty down our throats? Well, our beautiful Islam left no questions unanswered, and our beloved Prophet’s teachings are overwhelmingly and beautifully profound. But two of the characteristics I have personally found most effective and truly humbling are showing respect and mercy. We are up for some huge trials, people. The first challenge is the test of faith and the second one is in the test of wealth. The treasures will follow the Dajjal like ‘swarms of bees’, so if wealth impresses or blinds us now, imagine how much trouble we will be in at that time. But Allah is The Most Kind, He gave us all the aid we need in Surat Al-Kahf, and gave us the key to the trial of wealth in the verses after the story of the garden: remembering that all of this is temporary, for we will all stand before Him soon and testify to our deeds. Remember that 70 or 80 years on Earth are nothing compared to eternity in Jannah In sha Allah. If you want to be productive instead of destructive, whenever you hear that voice in your head of money talking, do yourself a favor and shut it up! Money comes and goes, but the best is still ahead of us, and will last forever. 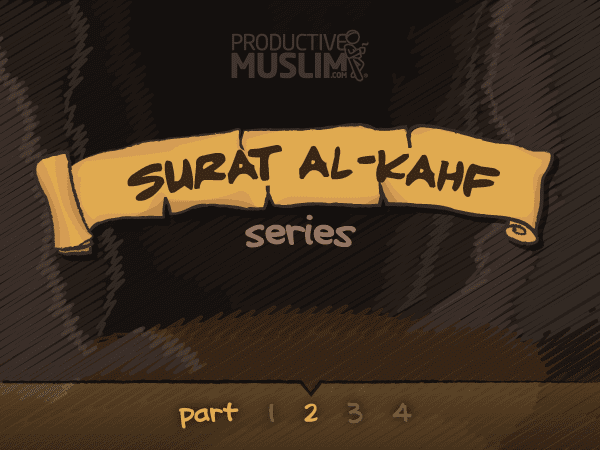 What are your thoughts and experiences related to the story of the man with the two gardens in Surat Al Kahf? Share it with us in a comment below.